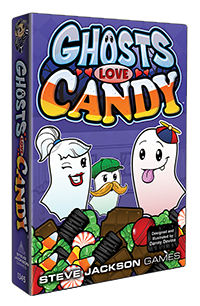 Daily Illuminator: Ghosts Love Candy Haunting Game Stores Now! June 5, 2017: Ghosts Love Candy Haunting Game Stores Now! Trick-or-treat any day of the year with Ghosts Love Candy, available now! This cute card game is in stores now, full of specters, sweets, and kids who want candy! Featuring design and art from Danny Devine, Ghosts Love Candy is easy to learn, with tons of variety and incredible artwork. You simply play ghosts to spook the trick-or-treaters and get their candy, without scaring them too much. But each kid has their own special power, and only some of them may have the candy you really love! For a look in the box, check out our unboxing on Facebook live, and if you want to learn how to play, check out the tutorial. We've even got a Ghosts Love Candy Game Day coming up on the weekend of June 16! Find a participating retailer near you, check out the game in person, and get some free swag to boot. So get your ghost on at a friendly local game store, or on Warehouse 23 if you don't have a store near you. Happy haunting!